While checking the U.S. national debt with Uncle Sam’s Debt Clock on my iPhone, I have noticed that it’s getting awfully close to the $13 trillion mark. So I decided to plot the latest data from the U.S. Treasury to try to predict when our debt will surpass that mark. Looks like it will happen any day now. 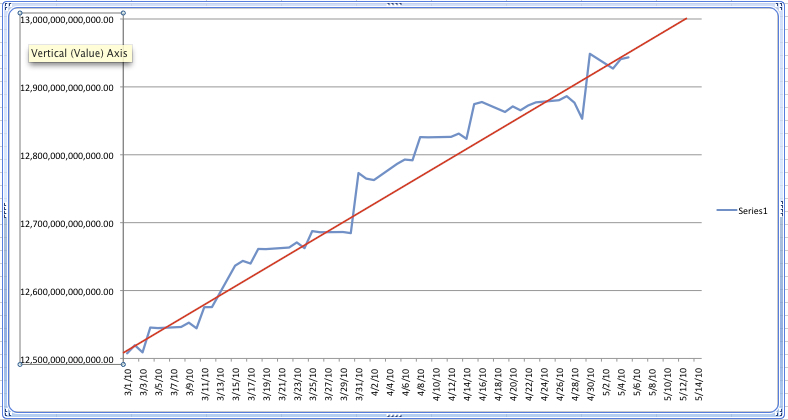 The blue line is the actual debt, and the red line is my extrapolation. Click on the chart above to view it full size. Version 1.7 has been updated with the March 2010 debt data from the UK Office for National Statistics. You are currently browsing the igibe blog blog archives for May, 2010.